A bowl of slimy eyeballs was passed around and I soon realized that the appetizers on another tray were encased in a kind of gooey ectoplasm. “I think that’s jello,” I assured the person next to me. After a little more chit-chat, I was convinced that the denizens of Mother Irving had put on another great haunted house. I was ready to smile and be grossed out a little more. A human head! And it was real–and alive! We shrieked and ran. It was even better than I’d expected. The email I received had urged attendees to “bring friends, many delicious friends.” Now I could see the reason. The haunted house also featured a room set up for Japanese tea. A hunched figure in the corner slowly turned as we passed through, staring in a menacing and corpse-like way, saying nothing intelligible. At another point, we were shown into a kitchen where we were greeted by a knife-wielding skeleton chef looking for people on his “menu.” With the strobe light and “blood” flashing everywhere, he advanced toward us and before I knew it my hand shot out to protect me and push him away. A little sheepish at my own fear, I moved on. The dining room was the highlight of the Mother Irving haunted house this year, I must say. But really everything in the food-themed adventure was awesome. Well done, Irvingites! You’ve done a foodie proud. Apple cider is simply delightful. I was reminded of that again this fall. A cup of mulled cider, I’d argue, is better than a glass of red wine at the end of the day or with dinner. And even though it tastes just like biting into an apple, it won’t get bruised or mealy while it’s sitting in your fridge. I believe that the reasons for cider’s attraction can be broken into the chemical and the psychological. The chemical part is easy. The beverage contains an ideal balance of concentrated fruit sugars and tart acids, combined with high levels of yumminess. These factors create a pleasing flavor on the tongue. On the psychological side, cider hits the shelves in earnest right when the weather is turning cold. Personally, as soon as the weather requires sleeves of any length, I start looking for the nearest cozy cave. I think most of us crave something warm and comforting right about now, but the grocery stores haven’t yet stocked–and we don’t want to admit that we need–supplies for scalding tea and hearty stew. And the cool thing about cider is that it can follow the blips and burps of the season. Drink it cold if you have a freakish warm spell in October, then heat it up when you get a chilly night. Even the process of preparing hot cider is just right. You can pour it into a pot and simmer it on the stove. The smell fills the house, filling the air that’s a little stuffier now since you’ve closed the windows against the cold. Cider is also something to you can offer to anyone–even a large group–and know that you won’t break the bank and everyone will like it. The hotel at Gallaudet offers free hot cider to anyone who comes any time of the day for the entire fall and most of the winter. Apple cider situates itself perfectly at the intersection of flavorful, available, likable, affordable, and heatable. Although in most other places “cider” means the fermented alcoholic drink, in the U.S. we still make a distinction. I like that. That stuff is hard cider, while the tasty stuff you can give to hotel patrons, 20-somethings, grandparents, and trick-or-treaters alike is just plain apple cider …and it’s delish. Pour a few cups of apple cider into a saucepan and start to heat on medium-low. Throw in a few whole cloves, cardamom pods, sticks of cinnamon, and/or pieces of star anise. Simmer for 10-20 minutes. I like to add a little water partway through to keep it from boiling down and getting too sweet. Now strain and pour into a big mug that requires both hands to hold. Sip and smile. de-frost-a-tion de-fra-‘sta-shun n. : The process by which a cook diminishes the foliage in her freezer by removing and thawing. Usually followed by cooking and a sense of satisfaction at eating local vegetation weeks after it has gone out of season. 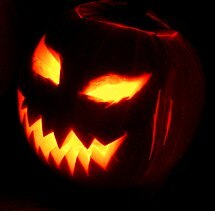 If you’re like me, you think as much about what food to bring to the Halloween party as what to wear. Because of this presumed obsession with food, you have probably realized that Halloween fare can be so much more than brown and orange M&Ms. It can be sophisticated, scary, or delightfully gross. And, I shall argue, it doesn’t have to be loaded with sugar and artificial colors. Take that, Mars! First of all, you should definitely check out this wealth of fun ideas. (One day I really want to try those eyeballs). Here are a few slightly simpler ideas. Frightfully Good Cheesies – Start by making some wasabi mayo: thoroughly combine about 1/4 cup mayonnaise, 1/4 cup softened cream cheese, a few teaspoons wasabi powder, and salt to taste. Quarter the slices of one loaf of dark pumpernickel bread and slice 12 oz. orange cheddar cheese (don’t worry – it’s usually colored with totally natural annatto). Assemble by slathering a little mayo on each slice and topping with cheese. Brains on Toast – Combine 8 oz. softened cream cheese, 1-2 Tbs. miso paste, 1-2 Tbs. finely chopped onion, and 2 tsp. vegetarian Worcestershire sauce. Spread on melba toast or toasted baguette. Top with strips of roasted red pepper “entrails” if desired. Chocolate Graveyards– Get yourself some chocolate cake batter, frosting, and chocolate cookies (organic and/or local, of course) and bake up a cake or a bunch of cupcakes. Frost the top(s) and cover with crumbled cookies (“dirt”) to create a graveyard. Position candy tombstones, gummy worms, green apple cut to look like tufts of grass, etc. along the top. Or try any of these healthy, yummy ideas. What cute jack-Os! What to do with radishes? They show up in the salads of every diner you visit and are a mainstay of produce aisles, but radishes are not the kind of thing you go crazy over. I’ve never heard of any cookbooks dedicated to them or festivals celebrating them. They are more of an afterthought. But there they were in my CSA share, coming at a rate of six to eight a week, so I decided to make an effort to use them. The other night, I happened to have a homemade seaweed salad hanging out in my fridge (not common for the average person, I know, but this is me we’re talking about) and a bell went off. I realized that the soft texture of the ‘weed and the crunch of the radishes would go together beautifully, with the shallow spice of the radish complimenting the deep, subtly salty flavor of its companion. 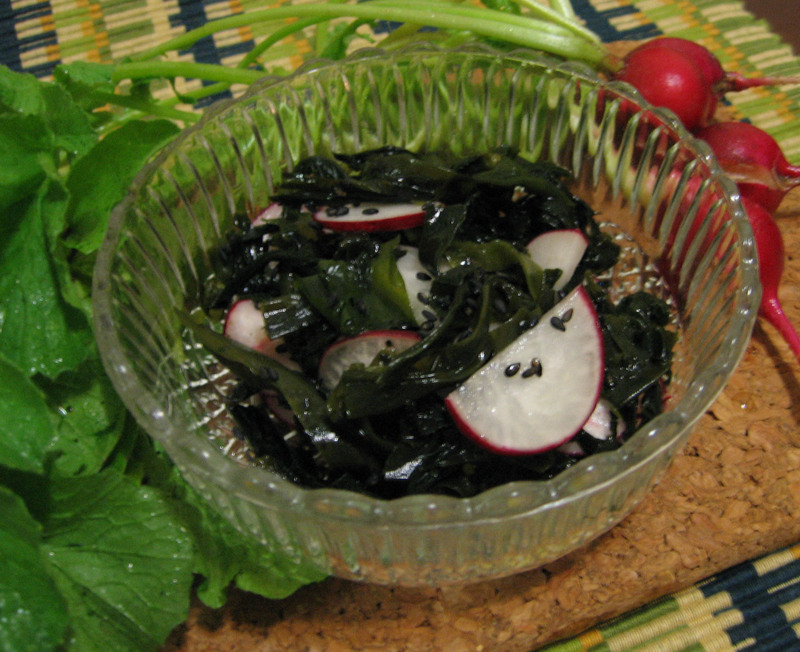 Not only that, but the dark green of the seaweed with the vibrant pink and bright white of the radishes would also look mighty fine together. So I devised and test drove a recipe that I think came out quite well. I wrote it out here with instructions for making it all from scratch. I’m taking the liberty of assuming you won’t have reconstituted seaweed sitting around. Soak the seaweed in cold water for 10 minutes or until soft. Meanwhile, slice the radishes and let them soak in the vinegar. Drain the seaweed and chop into bite-sized pieces. Remove the radish slices from their vinegar bath, reserving the vinegar. Combine and toss with sesame oil and sesame seeds. Add some vinegar or soy sauce if desired. You can’t go wrong with butter. It may, in fact, be the exception to Murphy’s Law. ‘The Art of Simple Cooking’ not up to Watersian standards? Oh my! I was eyeing the crisp piles of Waters’ new book at Kramer’s the other day, but P. just sent me this review. This dude just saved me some dough—and I mean that in both the cash sense and the onion-or-apple tart sense. But then again, warmed olives…mmm… that idea deserves some research. EcoDeaf is on the scene! Environmentalism has many faces and angles. There’s the reduce climate change folks, the eat sustainably people (I do my little “raise the roof” dance to that one), the wildlife conservation mavens, and so on. And now, we have EcoDeaf. Officially, EcoDeaf is “a place where eco-conscious Deaf people and ASL users meet to share resources and ideas.” In its pages, EcoDeaf has a little of everything, from the EarthShip sustainable housing method to awareness about climate change in congress to biodegradable doggie poo bags. We have seen the enemy, and it is… kitchen appliances! NPR reported recently on Japan’s struggle to achieve lower carbon emissions and its effort to target the kinds of things we leave plugged in even when we don’t need them. Unfortunately, my YouTube search failed to locate a video of this undoubtedly priceless ad. And Lida should know. He’s the director of the Institute for Sustainable Energy Policies in Tokyo. While it would be great if “kitchen activism” could save the world from the big, bad carbon emissions, I don’t think that’s the key. My message? Keep taking public transportation and cut down on air travel, use alternative energy sources, eat locally, green up your investment portfolio, and exercise your consumer sovereignty by supporting eco-friendly companies—or better yet, start one yourself. It’s World Vegetarian Day! * On this kick-off day for Vegetarian Awareness Month, I encourage my fellow veggies to celebrate and pat yourself on the back for joining a compassionate and sustainable movement. You and your millions of vegetarian brothers and sisters around the globe are making a difference! If you’re an omnivore, this is a good time to try indulging in more plant-based goodies and eliminating the animal-based ones… or just give a hug to your favorite vegetable lover (I am available for all your veggie-embracing needs). If you’re not ready to join the likes of Alicia Silverstone, Bill Maher, and Ghandi just yet, there’s plenty of time to prepare yourself for the Great American Meatout next March. *Thanks, Max G., for the tip off!